I love my slow cooker in the Summer time, especially since on more than one occasion I haven't been able to get my oven to start lately. Silly thing. I don't know why they can't make appliances that work when they're supposed to. I know I sound like an "old-timer", but they just don't make things like they used to! My oven is only three years old! So, my crockpot has become very useful when my oven is being temperamental. I just throw something in the slow cooker in the morning and don't even have to think about fighting with the oven in the evening. 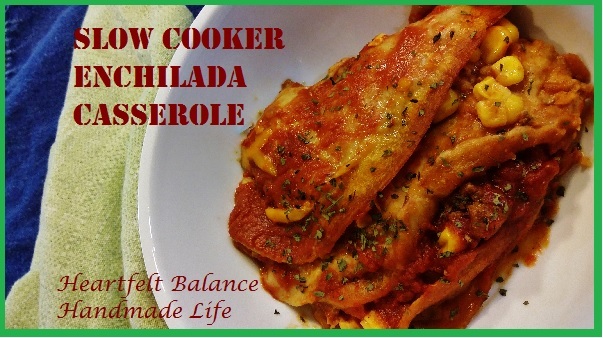 Everyone in my family LOVED this Slow Cooker Enchilada Casserole! I had the ingredients that we usually use to make enchiladas, so I decided to layer them all in the slow cooker. 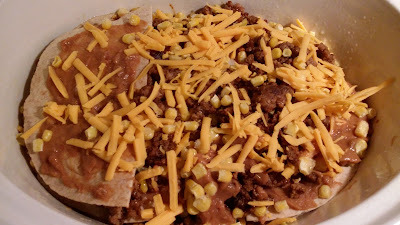 I actually usually make black bean and rice enchiladas, so this is actually quite different than the enchiladas I make in the oven, BUT I had the tortillas, taco seasoning and tomato paste. . . . . that I usually use in my enchiladas. I layered the ingredients like a lasagna. I almost called this recipe enchilasagna, but enchilada casserole works just fine. Since it's Summer time again and I barely have time to cook, wash laundry, fold laundry, clean. . . . . . . . these photos are not top rate. Haha! I'm never going to be one of the those food blogs with the pictures that jump off the page and make your heart sing and your mouth water. Well, I guess I can't say "Never". It's just not gonna happen in THIS post. 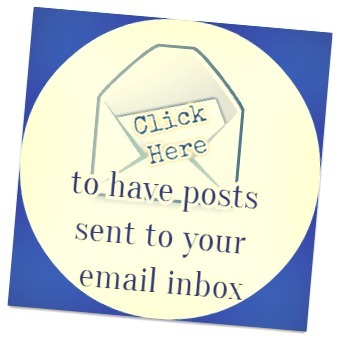 The photos are sufficient enough so that you can figure out how to make it. Right now at this point in my life I'm not a professional food photographer and I own that s**t! 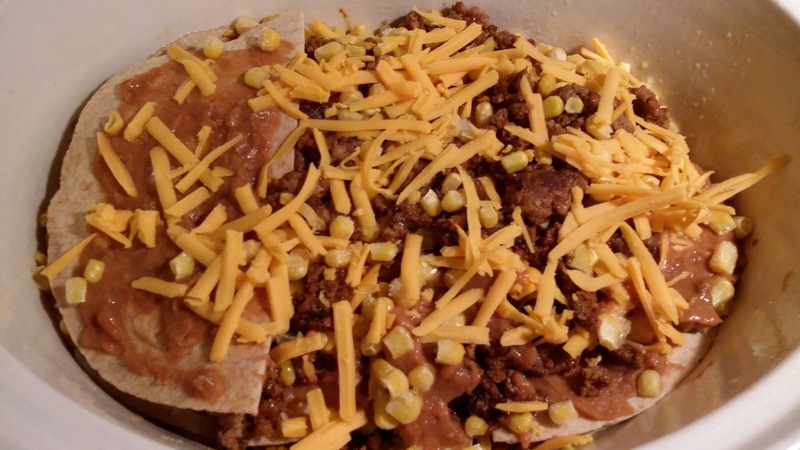 SOOOO, here's how you make the Slow Cooker Enchilada Casserole. Brown the ground turkey in a pan over medium high heat until it's cooked and browned. Add about 4 ounces of water and the taco seasoning packet. Let simmer on low for about 5 minutes. 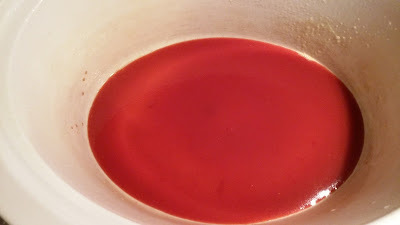 Whisk together the tomato paste and 16 ounces of water in a large measuring cup/bowl. 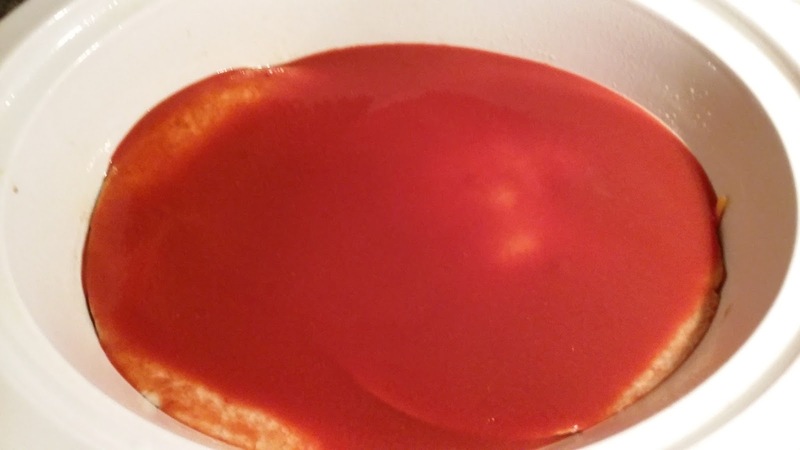 Spray the inside of a slow cooker crock with non-stick spray. Ladle a little of the tomato sauce into the bottom of the crockpot. 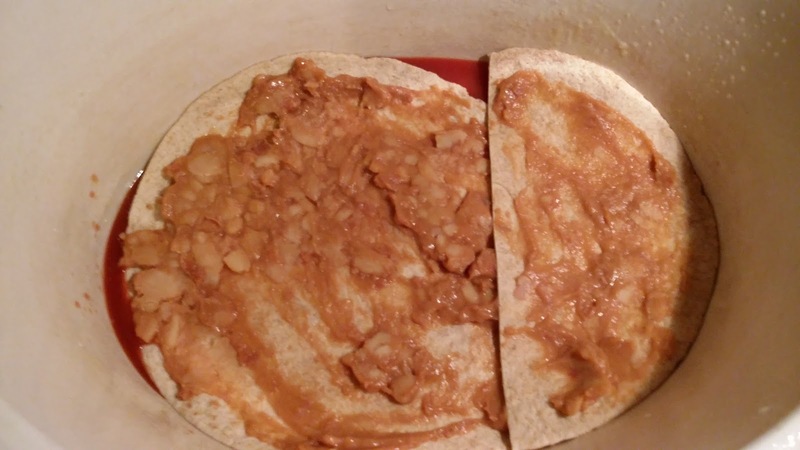 Spread one whole tortilla with one to two tablespoons of refried beans and lay it in the bottom of the crockpot slow cooker. Cut another tortilla in half and spread about one tablespoon of refried beans on it and lie it next to the first one. This will almost cover the bottom of the slow cooker. 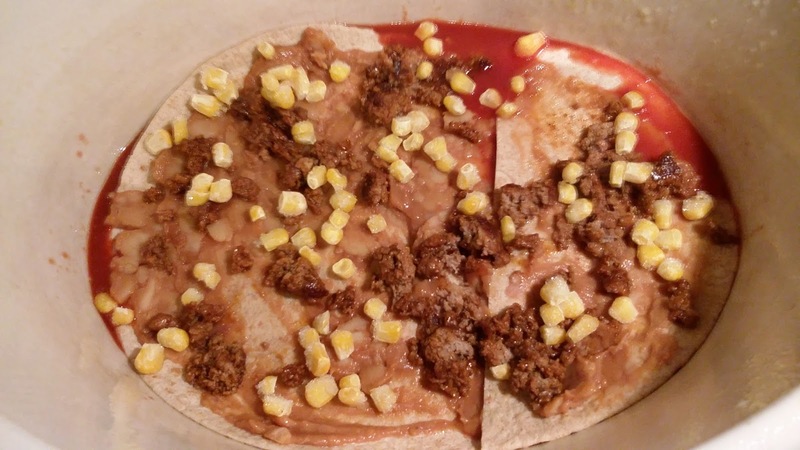 Sprinkle the taco meat over the tortilla. 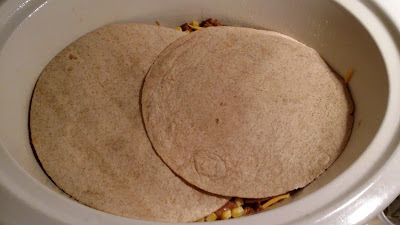 Sprinkle corn over the tortilla. Sprinkle cheese over the tortilla. Repeat steps until you've used all the ingredients except for 2 tortillas and enough cheese to sprinkle on the top. Place the last 2 tortillas over all of the other ingredients and press down a little to get everything even in the slow cooker. 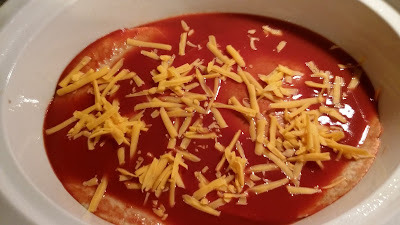 Pour the sauce over the top of the layered tortillas and wait a couple minutes to let it soak down into everything. Top with the remainder of the shredded cheese. 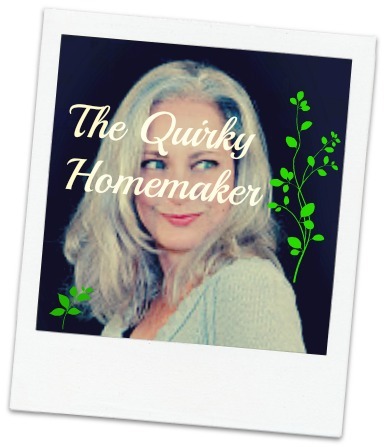 Do you use your slow cooker more in the Summer time? What's your favorite activity in the Summer? We're off to the Water Park again soon. Hopefully we can plan another family camping trip soon, too!